Not much is known about this early manufacturer from New York who is reckoned to have traded between c.1870-1895. The office and showroom address is usually given as 79 & 81 Duane Street and the factory was located at 300 & 302 Monroe St. Various brands are known (Eureka, Lion, Traveler’s Companion, Sporting, Yankee’s Notion, Old Harry) and cards identified as theirs have been found under the Empire Card Co., the Eureka Playing Card Company and the Universal Playing Card Co. 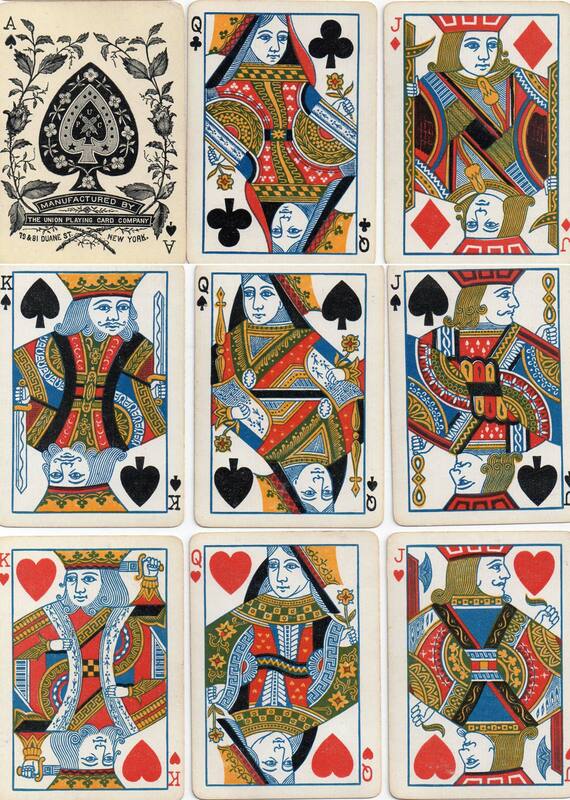 Above: three different aces of spades produced by the Union Playing Card Co. c.1875-1895. 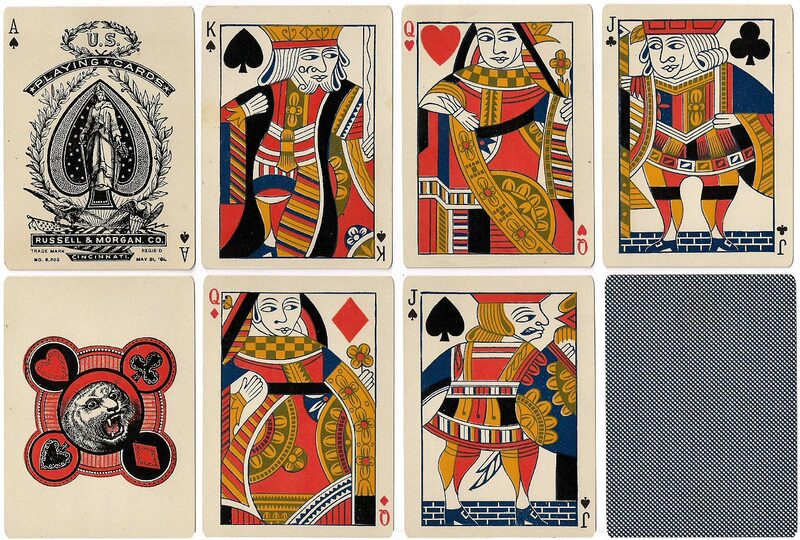 Above: deck with early joker by the Union Playing Card Co with courts derived from De la Rue, c.1875. Image courtesy Ken Lodge. Above: rare old playing cards produced by the Union Playing Card Co., New York, c.1875. 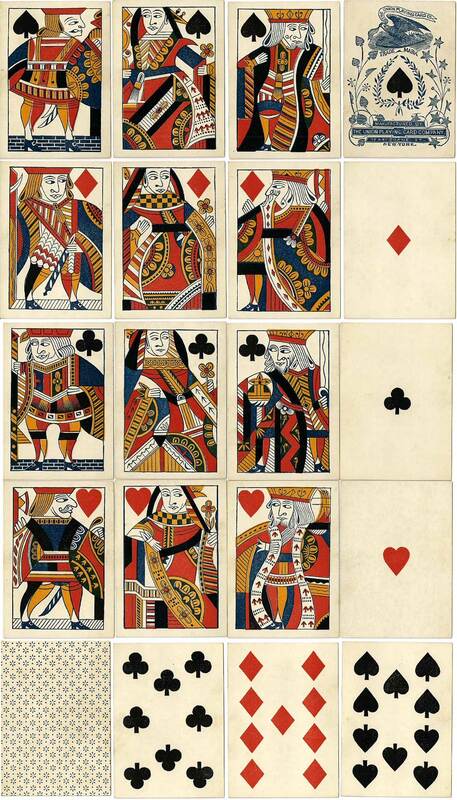 These single-ended court card designs are generally ascribed to Samuel Hart but Hochman lists a deck by Thomas Crehore dated c.1845 that had them. They were used by Hart, c.1858, by Dougherty, c.1855 and by Russell & Morgan Co., 1881 in its Tiger 101 brand, with and without indices. The pip cards are double-ended. Images courtesy Rod Starling.